From the latest episode of The B2B Lab by Marketing, we’ve chosen our five favourite clips, on topics ranging from content marketing, to manufacturing in Australia, to the best (and worst) in B2B communications. Watch the panel field audience questions and discuss the big issues. 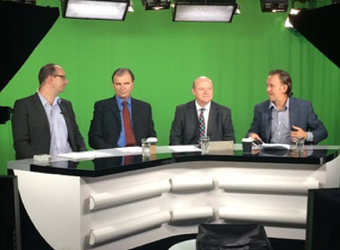 Featuring: David Redhill from Deloitte, John Clay from Arup, and Andrew Haussegger from Green Hat, as well as your ebullient host, Kimon Lycos. 5. How do leading B2B organisations build audience personas? 4. With the auto makers leaving, what’s next for Australia’s manufacturing sector? 3. What role does content play in the lead nurturing process? 2. What sustainability measures are customers (and employees) demanding? The next B2B Lab is in a couple of short weeks, register here and submit your questions with the hashtag #b2blablive, or using the chat window during the webcast.